In 2016, Filtration Group Corporation acquired the industrial filtration business of MAHLE GmbH. The acquisition, now sold under the FG brand, adds unique filtration capabilities to the Hydraulics business unit of Filtration Group. For more than 40 years, FG industrial filters have been the first choice for many European machine manufacturers and operators of mobile and stationary hydraulic equipment. 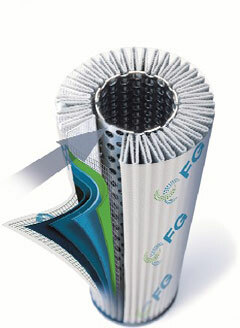 The multi-layered design of FG filter elements maintains high dirt-holding capacity in a broad range of applications. The filtration performance of our elements provides maximum protection under pulsating loads, even with increasing differential pressures. For maximum results, FG offers a complete range of solutions to comply with ever tightening requirements for reliable filtration tolerances and the functionality of highly sensitive hydraulic systems. Central to our wide array of filtration solutions is our proprietary, multi-layer PulseShield™ filter element construction. Our fluid filter elements with PulseShield compression sleeves bring together several innovations. The engineered construction combines our Premium Select fiberglass media with the patented PulseShield compression sleeve to yield best-in-class filtration results. The Premium Select filter media has been supplied to customers worldwide for many years and offers superior performance. Now, the PulseShield compression sleeve combined with up three Premium Select fiberglass layers increases the dirt holding capacity by as much as 30% in comparison to conventional filter elements. At the same time, the lower differential pressure results in a significantly reduced energy consumption. The compression sleeve secures the pleated star firmly to the inner core and guarantees uniform pleat separation throughout the entire service life of the filter element. This provides ideal filtration results, even through pressure pulsations, triggered by changing volume flows that may occur in the fluid system. Fluctuations in separation performance (ß values) are no longer a concern. The negative effects of short-term backflows are negated by the PulseShield compression sleeve. 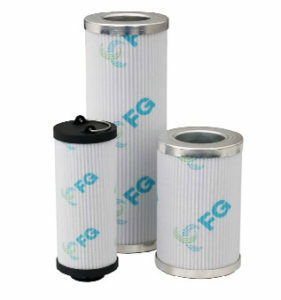 FG hydraulic filters are found in plant, construction and mobile machinery systems around the world. We are also a leading supplier of ASME, SAE and non-code cartridge filter housings and systems, with established patented systems for a wide range of applications. FG offers cutting-edge solutions for filtration applications that meet or exceed the requirements of leading machine designers and manufacturers. Our innovative, proven filter solutions for machine tools, injection molding machines, and systems ensure that production processes run smoothly, keep manufacturing and productions lines up and running, and provide the optimal basis for the high-performance, secure, and economical manufacture of high-quality products.